Iconic Airports: Where Are They Now? Native New Yorkers, retired flight attendants, tourists and architecture enthusiasts flooded the airy terminal, closed since TWA ceased operations in 2001, taking photos and sharing stories about the good old days of air travel. The mid-20th century was the high point in airport design; its airy and futuristic buildings can be appreciated by any modern day traveler who has ever had a layover at La Guardia. We looked at some of the most iconic airport architecture in the U.S. and their current status. Is your favorite still flying? %Slideshow-100872%DCA Terminal A – Washington D.C.’s first airport opened in 1941, and was considered to be the most modern in airport design at the time. In addition to its status as historic landmark and aviation icon, it’s also an archaeological site: the airport was built on a former colonial plantation and the birthplace of George Washington’s granddaughter. Status: The original terminal was restored to its original look in 2004 and 2008, with the interior currently undergoing a massive renovation. You can still see many parts of the original lobby and building as it looked when President Roosevelt dedicated it. Check out some vintage postcards of the airport from the Boston Public Library. Status: Dulles wasn’t a popular airport from the beginning, as it didn’t allow jumbo jets until 1970 and the distance from the city is still off-putting, but it’s now one of the busiest in the country and is continuing to expand. The mobile lounges are still around, but the new Aero Train is more commonly used. JFK Pan Am Worldport – The 1960 “flying saucer” was designed to bring the airplane to the passenger, sheltering the planes under the overhang for all-weather boarding. It was opened for Pan Am and renamed the Worldport in 1971 when it was expanded to accommodate the Boeing 747, and was the biggest passenger terminal in the world for several years. After Pan Am went bankrupt in the ’90s, Delta acquired the terminal and used it for many long-haul flights. Status: Although it is on the list of the most endangered historic buildings and beloved by many airline and architecture enthusiasts, it looks like the Worldport is permanently grounded. While Delta just completed a major renovation of their other terminal at JFK, they need the room for airplane parking, and the flying saucer is already beginning to be demolished. LAX Theme building – The distinctive Theme building is a perfect example of 1960s futuristic architecture, resembling something out of the Jetsons and actually inspiring the cartoon’s design. Part of the original ambitious plans for the airport was to connect terminal buildings with a giant glass dome, with the Theme Building serving as the main terminal, as in the picture above. One of the most famous buildings in the world, it’s photographed more than the Eiffel Tower. Status: The Theme building has been a restaurant since 1997, and you can visit Encounter for a meal even if you aren’t flying. The free observation deck is open on weekends only if you just want to watch the planes taking off. LGA Marine Air Terminal – For a passenger who arrives at one of La Guardia’s many dim and low-ceilinged gates, it’s hard to imagine that an Art Deco beauty is part of the same airport. Opened in 1940 and funded by the post-depression Works Progress Administration, the Marine Air Terminal originally served the glamorous Clipper planes, carrying 72 passengers on long transoceanic flights with sleeping berths and a high-end restaurant. The second World War made such flying boats obsolete, and the terminal sat unused for several decades. Status: It’s now the main hub for Delta’s shuttle service to Boston, Chicago and Washington, even after a massive renovation to Delta’s other terminal at LGA. While it might have less modern facilities, it’s the only terminal to feature an original mural dedicated to flight (with a secret message). LGB Main Terminal – The first trans-continental flight landed at Long Beach in 1911, but the Streamline Moderne terminal wasn’t built for another 30 years. The modernist building was considered avant garde at the time, but now feels classic and a bit romantic among airports, the kind of place you can imagine passengers boarding with hat boxes and cat eye sunglasses. Much smaller than nearby LAX, JetBlue made it a west coast hub in 2001 and put the California airport back on the map. Status: Last year, LGB was fully modernized to make it more green and “resort-like,” with outdoor spaces outfitted with fire pits and cabanas. The renovation uncovered more of the mosaic tile art by WPA artist Grace Clements, then 28 years old, and covered by carpet for 70 years. Today’s government shutdown will affect many groups of people, travel-related and otherwise. But one group chose not to be affected today. 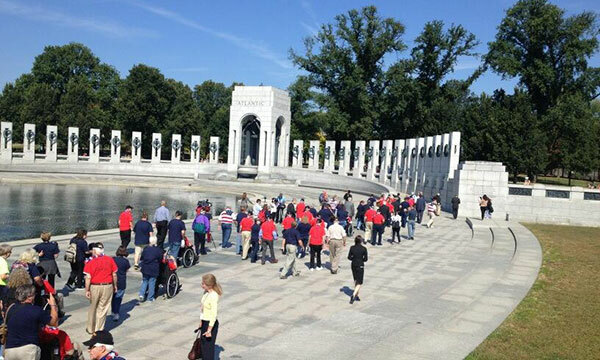 A group of World War II veterans, led by the Mississippi Gulf Coast Honor Flight, simply knocked down the barriers at the WWII Memorial in Washington, D.C., so they could get inside. Once again, I’m back in Oxford for my annual summer working holiday. I love this place. This quintessentially English city offers beautiful colleges, the world’s coolest museum, even the chance to bump into the Queen. 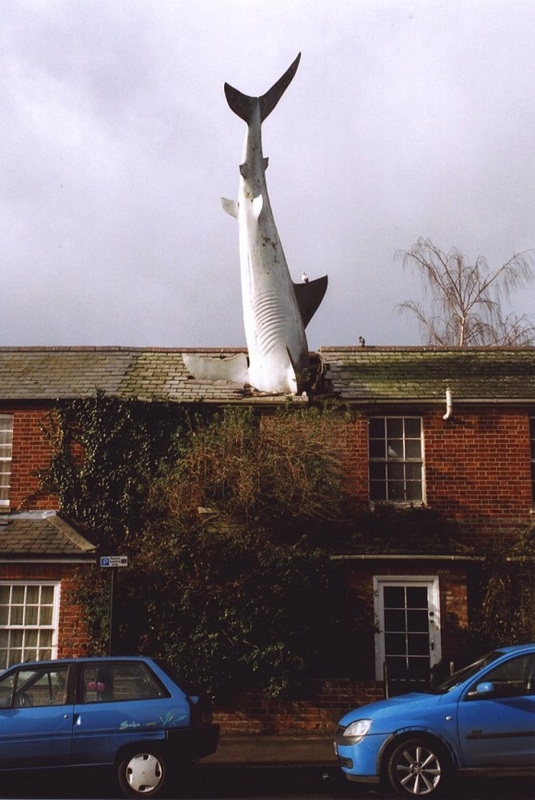 But all this pales in comparison to the sight of a giant shark crashing into a roof. The clipboard Nazis in the local council were not amused. They tried to have it removed as a pubic hazard. When their engineer said it was perfectly safe, they tried various other excuses. Much legal wrangling ensued. Decades later, the naysayers are all gone and the shark is still there. It’s a much-loved local landmark, a modern folly. I see it every time I come in on the bus from London and enjoy pointing it out to newcomers. There’s even a Headington Shark Appreciation Society on Facebook with more than a thousand members. So if you’re coming to Oxford, pop on over and see the Headington Shark. The government of Germany has begun construction of a monument to remember the physically and mentally handicapped people killed by the Nazis. While everyone knows about the six million Jews killed during the Holocaust, Hitler’s other victims are often forgotten. They include socialists, Communists, blacks, homosexuals, Gypsies and anyone else who didn’t fit the vision of a pure Aryan society. Hitler started a program, known as Action T4, to eliminate the mentally and physically disabled in 1939. Surviving documents show at least 70,000 people were killed, but historians estimate the number may actually be as many as 200,000. The BBC reports that construction is underway on a memorial to these victims next to the Berlin office where the program was managed. The memorial will be a 100-foot glass wall. The city already has monuments to the Jewish, Gypsy and homosexual victims of Hitler’s reign. Love letters from fans bundled with a ribbon. A Giovanni Boldini painting worth more than $2 million. Hairbrushes caked in 70 years’ worth of dust. All sitting right where the owner left them during World War II. According to the Daily Mail, a time capsule of an apartment in Paris’s 9th arrondissement was discovered three years ago upon the 91-year-old owner’s death. She had fled to the south of France when World War II broke out, and it looks as though she never returned. Authorities found the once-elegant apartment in a cluttered, lived-in state, its brocade wallpaper faded and everything covered in cobwebs. Among the abandoned possessions, one painting caught an expert’s eye: a luminous image of a flirtatiously posed young brunette with a slinky pink silk or satin gown spilling far down her shoulders. The expert suspected it to be a Boldini (the Italian was a friend of Edward Degas and a noted portrait artist in Paris in the late-19th century). But he had no proof – until he found, among the scattered papers in the residence, a love letter from Boldini to the actress Marthe de Florian, a French star at the turn of the century. De Florian was the apartment owner’s grandmother, and those bundled love letters were from her admirers, including one French prime minister. Later identified as a 1898 Boldini, the painting eventually fetched more than $2 million at auction, six times its opening bid and more than any other work by the artist.